Human beings have always been fascinated with caves. These clandestine spaces carved by mysterious forces elicit our natural curiosity, while at the same time the foreboding depth of their darkness creates a very visceral apprehension. Coupled with the baseline fear of earthquakes that many of us in California share, caves are often regarded with suspicion. Ironically, it is the cave that typically has more to fear from encounters with humans, and for that reason White Moon Cave and the CEMEX Redwoods Property are protected, and off limits to the public. We at KQED were fortunate enough to get a rare invitation to explore this natural wonder, and capture it on video for the very first time. 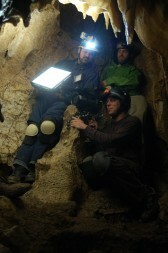 The KQED Science team was allowed special acceess to be the first to film in White Moon Cave. When Peninsula Open Space Trust and The Sempervirens Fund joined forces in 2011 to purchase the CEMEX Property near Davenport, CA they had no idea that White Moon Cave even existed. Their intent was to purchase the large tract of land from the Mexican cement company, as part of the Living Landscapes Initiative, in order to conserve the coast redwood groves that blanket the mountainous terrain. It was only after the purchase that they received a call from members of the Western Cave Conservancy revealing the cave’s existence, and the need to protect it. As I twisted through the narrow entrance to the cave, I felt as if I were moving between two realms of existence. The cave air is cool, laden with moisture; the air inside exudes an earthy perfume, both familiar and strange but pleasant; the enveloping sense of stillness grows into something profound; time seems to move slower, insulated from the light and sound of daily life. One of the most powerful ways to experience this exquisite isolation is to find a corner, sit down, and turn off all of the lights. It takes a few minutes, but soon the darkness and quiet wash over you. Deprived, the senses become magnified. Even the sound of a single drop of water falling onto the sandy cave floor resolves in crisp detail. Gordon Clark of The Peninsula Open Space Trust removes rocks that guard the hidden entrance. Moving through the cave could be very challenging. The cave floor varied from slippery wet rock to fine dry silt that clung to every piece of clothing. The unforgiving marble walls seemed to reach out to bite at my shoulders and knees, and the ceiling seemed to creep just below where I expected I to be, making my helmet more than a mere precaution. This process can take thousands to millions of years. But sadly, malicious or absent-minded humans can reverse it much more quickly. Some cave visitors don’t see the harm in taking ancient cave decorations as personal souvenirs. But when this minor theft is multiplied by hundreds of other visitors, the cave is quickly robbed of its ancient beauty. Others selfishly spray paint or etch their names into the cave walls. “After several thousand people come through, then you see a cave that is really a hulk of its former beauty,” said our guide Bruce Rogers of the Western Cave Conservancy. 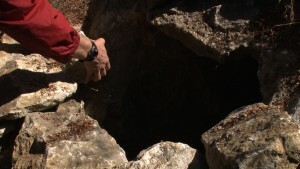 Similar caves in the Santa Cruz area have been victims of vandalism and overuse. But for those interested in responsible caving, I encourage you to look into The Western Cave Conservancy, a collective of citizens who have surrendered themselves to the draw of the caves, but do so with the appropriate level of scientific inquiry, safety and respect. Interested parties should attend a local ‘grotto’ meeting as they are an excellent resource for those who share their fascination with the subterranean.